High-precision pliers with special jaws designed specifically for the shaping, coiling and wrapping of wire and sheet metal. Originally designed for making jewelry, each pair is meticulously hand finished to minimize marring of your workpieces. Non-slip foam grips on smooth-acting, sprung handles let you work for hours in comfort. 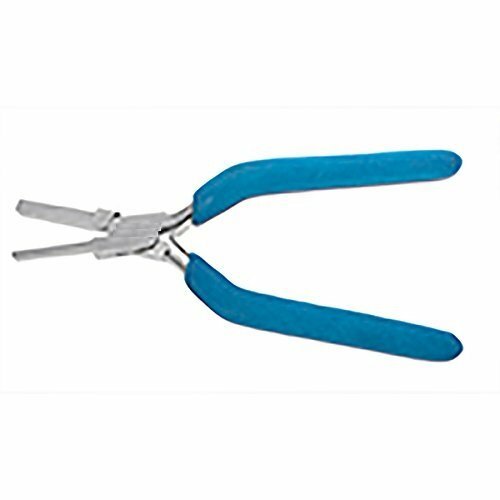 Small Square Mandrel Plier provides two sizes of square jaws to form perfect square shapes in wire and sheet metal. Larger jaw measures 5 mm square; smaller jaw measures 3 mm square. Total length of plier is 6.75 inches. Length of jaws from tip to box joint is 34 mm. Rated for use with up to 24-gauge dead-soft sheet metal and 16-gauge dead-soft wire. Larger jaw measures 5 mm square; smaller jaw measures 3 mm square. Rated for use with up to 24-gauge dead-soft sheet metal and 16-gauge dead-soft wire. Non-slip foam grips on smooth-acting, sprung handles let you work for hours in comfort. Special jaws designed specifically for the shaping, coiling and wrapping of wire and sheet metal. Meticulously hand finished to minimize marring of your workpieces. If you have any questions about this product by Makersource, contact us by completing and submitting the form below. If you are looking for a specif part number, please include it with your message.